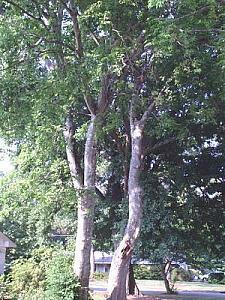 Hackberry is a tree with an elm-like form and is, in fact, related to the elm. The wood of hackberry has never been used to any large extent due to its softness and an almost immediate propensity to rot when in contact with the elements. However, Celtis occidentalis is a forgiving urban tree and is considered tolerant of most soil and moisture conditions. Hackberry forms a rounded vase reaching a height of 40 to 80 feet, is a rapid grower, and transplants easily. The mature bark is light gray, rough and corky and its small berry like fruit turns from orange red to purple and is relished by birds. The fruit temporarily stains walks.